OEM Carbon Fiber Trim Kit? I never knew there was one! Anyone have any pics of it? Not the greatest pic but here's one. It looks better in person I would say. Yea it's real. It adds a little more to the interior look, I like it. Yeh I've got the whole kit now. 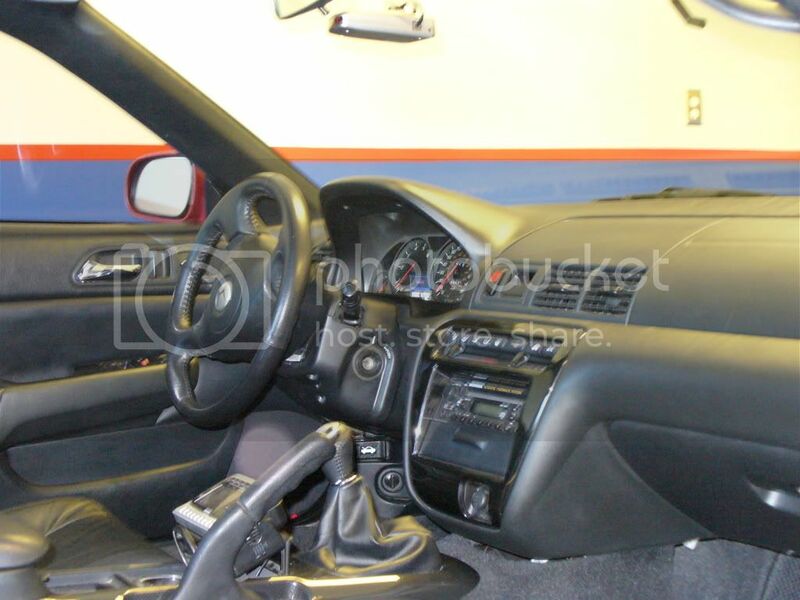 CF radio surround, console, door panels and dash insert. Apparently there's a 7 piece set, but I"ll be buggered if I can work out where the other two pieces go. You got the oem one? Pics? Also where'd you get it from? ebay!.............go to my members ride page and you can see mine. i have it, it's really nice, i'm only using the radio surround and the door inserts because they were the only actual replacement parts. the center console piece is just cover that sticks on, kind of shotty to me, so it's sitting in my closet. i believe the 7 piece kit has surrounds for the left and right AC vent, not sure about the last piece, i think it's a gauge surround. yogi has this kit as does ogsmakdade. It looks really good but I'm painting all my interior pieces in that kit the color of my car so I can be a little different. There's also a wood kit they made but it only looks good on the tan interior IMO. E that's a good plan. I too thought of this a while back, but I'd be too paranoid of scratching that stuff. I wanna be able to drive and enjoy her. I don't need any thing else to worry about lol. how much did you pay ogs? I'm not sure I got it 2 years ago. $250 or so. lemme search. I know I can buy it for $120, before shipping. I was just wondering if that was a good price, or if I could get it cheaper. Here are some pics. This is all I have. Looks like an s2000 wheel. Doesnt the type s have red stitching? BTW whats the mobil sticker for? Nope. It's and S2K wheel and bag. Had it in there for a few years now actually. whats the mobil sticker for? Oil change reminder. I hate them on the windshield so I put them there. Dude what the heck is that huge thing? Is that your shift knob? That is not an OEM piece. That would only come with an aftermarket kit. 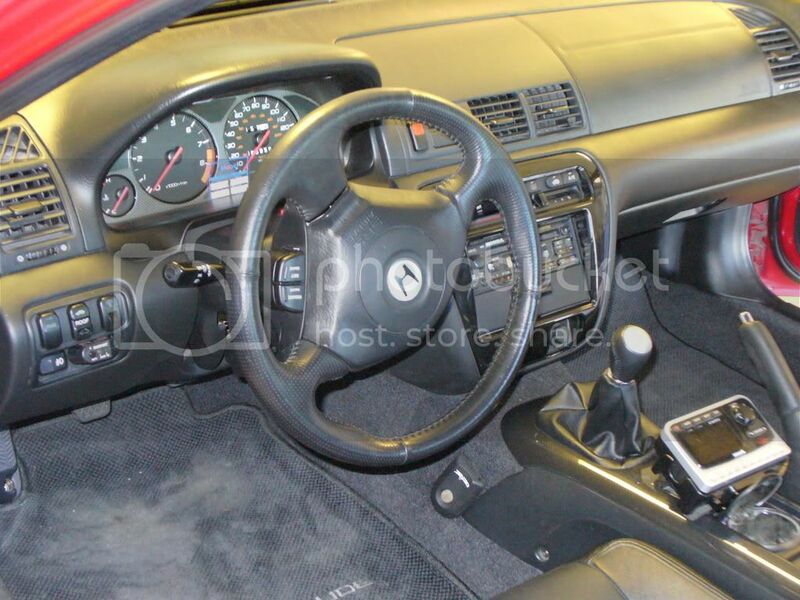 The only OEM stuff is the radio/heater control surround, the console overlay, and the door trim pieces. The clock piece only was an after market supplied piece, (Non-OEM). I see you need floor mats though.